Keeping your employees at their best – the right training for every task. Your passengers should feel safe and at ease. This is something your drivers know first hand. This is why you seek out suitable training measures. The bus and coach business is tough, and every day is full of new challenges. Your driving staff needs the skills to tackle their jobs with maximum efficiency and the proper training to cover all important areas of their work. The proper handling of your fleet should not be neglected, since increasing fuel prices and unnecessary workshop visits can be an issue to your success. Based on our long-term experience, we have tailored all of our training courses to meet your needs. At the same time we also live up to various requirements specified in the Certificate of Professional Competence (Driver CPC). We provide the perfect combination of theory and practice and only employ qualified experts and trainers. Let us convince you of our dedication to buses and coaches. 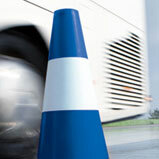 Professional training to prepare your drivers for a variety of traffic situations. Allowing your workshop personnel to carry out small repairs and maintenance work independently.